2 Feet Of Snow? 1 Inch Of Ice? Monster Storm Revs Up A massive winter storm is churning toward the nation's midsection as the region gears up for a potentially deadly mix of snow, sleet and ice, followed by a blast of Arctic winds. The storm is expected to carve a frigid path from Denver to New England by week's end. 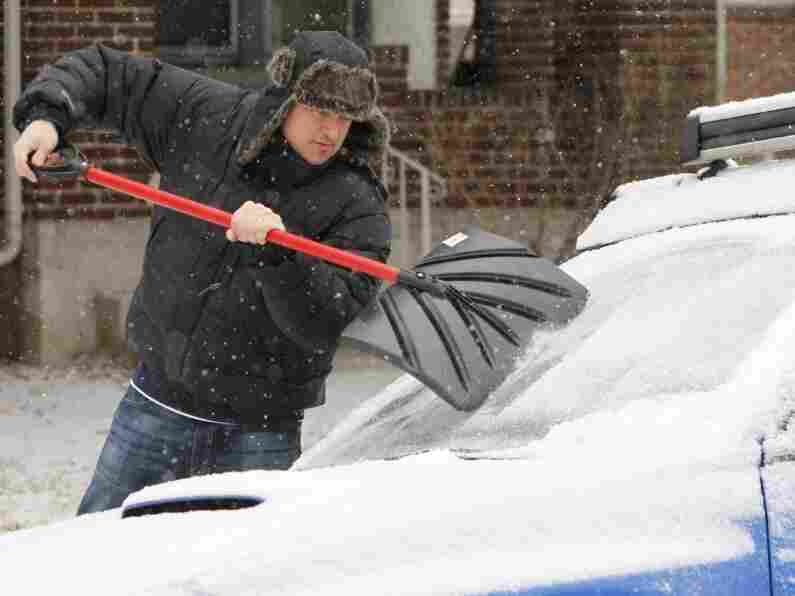 Tom Gillian uses a snow shovel to chip ice from his windshield in Denver on Monday. A monster winter storm is revving up in the Rockies and is expected to drop up to 2 feet of snow in some parts of the Midwest and an inch of ice in others. A monster winter storm bigger than some places have seen in years churned toward the nation's midsection Monday as the region geared up its defenses against a potentially deadly mix of snow, sleet and ice. While the Northeast has spent this season digging out from snowfall after snowfall, the Midwest has been comparatively unscathed. Not this time, forecasters say. Up to 2 feet of snow was predicted for some cities, followed by a blast of Arctic winds. The storm is expected to carve a frigid path from Denver to New England by week's end. Thunderstorms, tornadoes and drenching rains are predicted farther south. The Federal Emergency Management Agency, urging residents to prepare for the worst, is already dispatching teams of emergency responders. Winter storm warnings and watches are in effect from Texas to the Great Lakes states. Schools are already closed in Kansas and Missouri. As the first flakes fell Monday, transportation officials readied storm-fighting equipment, and some airlines encouraged travelers to rebook flights leaving from Chicago's major airports. Patrons lined up outside Edele and Mertz Hardware just a few blocks from the Anheuser-Busch brewery in St. Louis, waiting for the store to open. Snow shovels were big sellers, but worker Steve Edele said ice melt and salt were flying out the door.
" 'Freaking out' is a great way of putting it," Edele said. "The icing — that's what scares people." The National Weather Service says the storm could drop up to an inch of freezing rain and issued a blizzard watch for Tuesday and Wednesday for southern Wisconsin, northern Illinois and northwest Indiana. Five- to 10-foot snow drifts are possible, and the weather service said winds could reach up to 60 mph on Tuesday. Freezing drizzle made roads slick in northwest Missouri early Monday, sending cars sliding off highways in Buchanan County and prompting authorities to cancel classes at public and private schools in the area. St. Louis-based utility company Ameren opened its emergency operations center amid worries that the weight of the ice and snow could duplicate a crisis in 2006, when an ice storm downed thousands of trees and power lines. Parts of southeast Missouri were left without electricity for more than a week. After burying the Midwest, the storm is expected to sweep into the Northeast, parts of which are already on track for record snowfall this winter. In New Hampshire, where pedestrians have been forced to walk in the street in some places because of piled-up snow, crews rushed to remove it before a new foot or so is predicted to fall on the state.